Sterile Bone Wax, made of 3 components, not absorbable, in pouch of 2,5 gr. It’s sterile and packed in alluminium foil (inner) and plastic /paper pouch (outer). Bone Wax is used to control bleeding from bone tissue by plugging bone small channels that contain capillaries. Bone Wax stops hemolysis of bone and acts as mechanic barrier. Bone Wax is easy to use and shape by only use of hands. Bone Wax must be no used in cases ehre there is need of rapid fusion and regeneration of bone tissue or when occur infections. Nasal sponge for epistaxis and post-operative haemostasis. It’s made from PVA sponge (polyvinyl alcohol) and each nasal sponge has string in medical silk. Each item is ready for use and there’s no need of use ointments for insertion in nasal cavity. Nasal sponge expand itself in order to generate required compression on the wound surface and thus result in physical haemostasis. 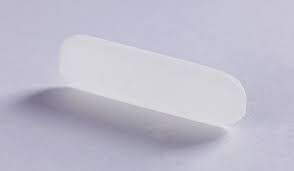 PVA sponge (polyvinyl alcohol): syntehtic and biocompatible material – sterile. PVA Nasal sponge for epistaxis and post-operative haemostasis. After contact with water of saline solution, each Nasal sponge expands itself and increase its volume: this allows to create an appropriate compression on bleeding surface for help and fast physiological process of haemostasis. 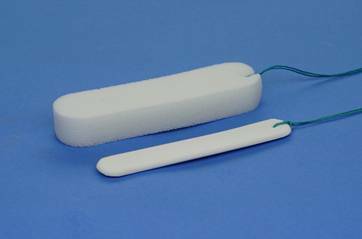 The soft sponge in PVA give an appropiate support and pression to bleeding surface. Nasal sponge are available in 15 different size and shape.